William and Arthur Sim where born in Toowoomba, Queensland and later moved to South Australia with their parents, George and Christina Sim, settling in West Hindmarsh. The brothers enlisted in the army together on 25 September 1916. William was aged 25 years and 9 months and Arthur 23 years and 3 months. Both where assigned to the 50th Battalion. Five months later they left Adelaide embarking on 24 January 1917, on SS Miltiades, and disembarking at Devonport a district of Plymouth, UK on 27 March 1917. Their packet is very small, limited to one eyewitness account of the men’s death and burial. However looking into their military records brings a broader view of the soldiers’ and their parents’ experience of World War 1. During the night of 18 October 1917, at Broodseinde Ridge in Belgium, the Sim brothers were in their dug-out when a gas shell landed killing them instantly. The eyewitness, Henry Charles Harper, said that he helped to dig the brothers out and bury the men together to where they died. The witness stated that they erected a cross inscribed with the particulars of the brothers. William was aged 26 and Arthur 24. Correspondence in both of the brothers’ military records indicates that in 1920 their father George queried the Military about the location of his boys’ graves. He was informed his sons’ remains were located in the Broodseinde Cemetery by an eye witness, Henry Charles Harper, who called himself a ‘comrade’ of the boys. However in October 1922, George queried again the whereabouts of his sons’ place of burial after a friend of the family had visited and inspected the Broodseinde Cemetery and could not locate their graves. A reply from the Military was received in 1925, indicating that whilst an eyewitness had stated that their bodies were buried in the Broodseinde Cemetery, upon further investigation, no trace could be found of the brothers’ final resting place. 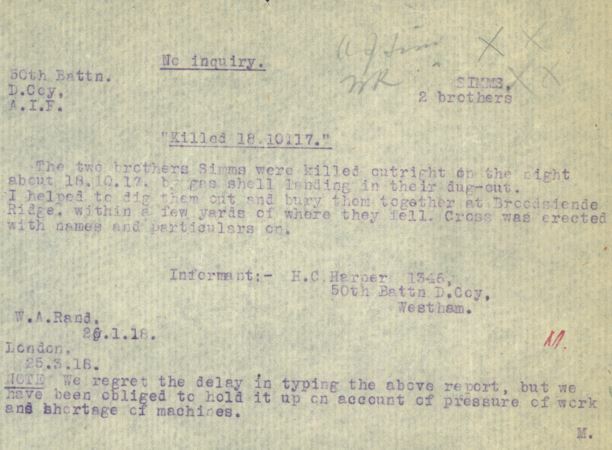 The delays in their parents receiving information about William and Arthur Sims’ burial place is shown in the packet with the Red Cross volunteer regretting ‘the delay in typing’ of the report. The brothers’ military records reveal their father’s letter stating that he had not yet received the scrolls of honour issued to next of kin and thought ‘perhaps they might have been overlooked’. Whilst the final resting place of William and Arthur Sims remains unknown, their memory lives on through their service history and South Australian Red Cross Information Bureau records.